Alcohol and drugs - What about the family? In their anxiety to help someone addicted to alcohol or drugs, families, friends and carers often don’t recognise how they themselves are being affected by the situation, nor do they know where to find help. Carers often feel guilty about seeking help, it’s common they feel they should be able to cope with the situation. In the early stages of addiction, it is hard for a relative to admit there is a problem. You may have found yourself thinking or saying, “He doesn’t have a problem, he just drinks a bit too much,” or “If she gets away from those friends, or changes her job, I’m sure she’ll stop using”. It’s very difficult to think or say even to yourself that your loved one has a drink or drugs problem. Even when you’ve admitted it to yourself, what can you do when the person concerned denies that they have a problem? What do you say when you find hidden bottles or smell cannabis around the house, or find other signs of drugs use? What do you do when your partner loses his job because he’s drunk, or your child steals from you to support their drug habit? Some families find themselves living in a nightmare: answering the door to the police, paying off debts, trying to explain to small children why mummy isn’t able to get up to take them to school again. You may be familiar with the rows you and your partner have over your drug taking child or the guilt you feel because other children in the family blame you for not being stronger and taking action against the drinker or drug taker. Alcohol and drug addictions are classless, ageless and sexless. Anyone can become an addict; from the high-flying executive to the ‘stereotypical’ user. Winston Churchill was an alcoholic, King George V was an opium and cocaine user. When a family member contacts a counsellor, it’s common they’ve usually been trying to cope with their situation for some time. They are feeling stressed, anxious, shocked, helpless and hopeless. Their first question is almost always the same, “How can I stop my relative from drinking/using?”. They feel that they have to find a solution; that if they can find the right thing to do, the right way of going about it, they can cure the user and restore that person to the way they used to be. The response to that question is always the same, a bleak, discouraging one because the answer is, “You can’t do anything to stop that person drinking or taking drugs. They have to do it themselves”. Most people are surprised, despondent or resigned to hear such a response. But there is a more positive point to be made: “You may not be able to help the user but you might be able to help yourself”. With addiction, it’s not just the user or drinker who is affected, addiction impacts on everyone in the family and everyone is equally important. One of the most important aspects in family counselling is looking at what part you play in the substance misuse problem. This doesn’t mean it’s your fault or that you’re to blame, it’s about how you respond and behave towards the user. Frequently family members enable the drinker/drug user. Enabling means that either consciously or unconsciously you allow your relative to continue with what they do without suffering any consequences. Have you ever phoned their employer to say they are ill, when they’re drunk or high? Have you accepted blame for their actions (“If you didn’t nag me I wouldn’t drink”)? Have you avoided confronting them about the problem because you’re afraid of their response or aggression? Have you paid bills, legal costs, rent, food, given money to pay off dealers or loans, or bought drugs or alcohol for the person through fear of the repercussions if you don’t? Have you repeatedly given ‘one more chance’? Have you threatened to leave then haven’t, or threatened to make the other person leave then backed down? Have you finished off a task that the person has failed to complete? These are all examples of enabling and it’s very easy to enable someone without even realising that you’re doing it. You’re simply ‘helping’ them because you care about them. However, by helping them you have allowed them to avoid responsibility for what they do. In order for someone to be able to change their own alcohol or drugs use, they have to take responsibility for themselves, which is why a relative, friend or carer cannot solve the problem by doing it for them. When relatives find themselves trapped within someone else’s addiction, counselling can often help family members to look at themselves and their own motivation. In order to be able to make changes for yourself, rather than the addict, it may be necessary to look at your own behaviour and what underlies it. If you’re unable to stand up to your alcoholic son, why do you feel that way? A mother, who, through talking in counselling, came to recognise that she grew up with a very controlling father, had felt disempowered and that, in the same way, she felt unable to oppose her father, she felt unable to oppose her son. Through this recognition she was able to re-empower herself and find ways to stand up to her son – she stopped enabling him. She learned how to say “No” and to stop taking the blame. Everyone is different and we all respond to situations in various ways. There isn’t a right or wrong, what’s important is to look at yourself and the interaction within your particular family. You may be able to put in place changes in your own life which make the situation more tolerable or even enjoyable. There is a strange phenomenon, the ‘domino effect’. When a relative is able to make changes in his/her own life, it often has a knock-on effect on the user. When the substance misuser recognises that the relative has taken back their own power and ceases to enable them, they start to look at themselves and make changes. They learn that they have to take responsibility for themselves because their relative no longer will. This is not universal but does frequently occur. Another way in which relatives can help themselves is by understanding the drinker/drug taker more. Relatives often think, “Why can’t he just stop drinking, just not buy any more?” or “She just needs to pull herself together and be stronger”. In counselling, once again, it can be very helpful to look at what has led your relative into drugs/alcohol misuse. Sometimes the reason may seem clear, “He started drinking three years ago after that little girl ran out in front of his car and was killed”. However, it is not necessarily so clear-cut. For example, if your wife is an alcoholic, what was her life like growing up; what have her other life experiences been like? In the case of a child who has an addiction, it can be mystifying why that child and no other in the family misuses substances. This doesn’t mean that it’s anyone’s fault, we all experience life differently and respond to situations differently. Some people learn to take responsibility for themselves and others avoid it. 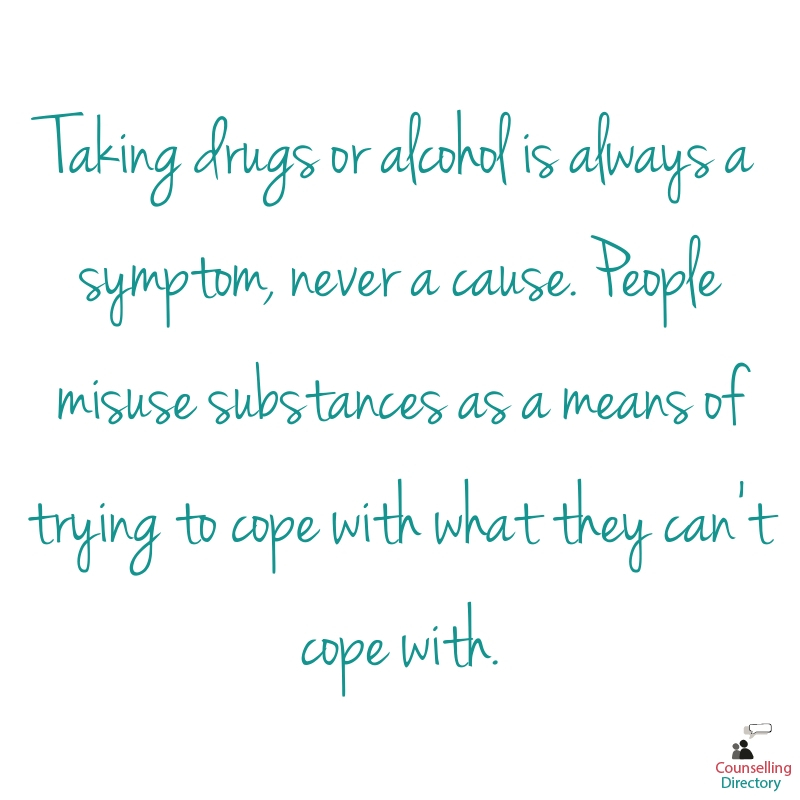 Taking drugs or alcohol is always a symptom, never a cause. People misuse substances as a means of trying to cope with what they can’t cope with. Whilst only the addict can make changes for themselves, further understanding your addict can help you as a relative, to feel less frustrated and guilty. This might rescue you from the trap of feeling that you have to rescue them. In the same way that you can make changes by understanding your own behaviour and motivation, so can the drinker/drugs user. Once a substance misuser recognises and accepts that they have a problem, they can seek help. Professional services can help them reduce or stop drinking or using and talking therapy can help to look at the underlying reasons why they resort to substance misuse. This may not be quick or easy for them to do; they may relapse several times, they may only partially or never succeed, but the only chance of change is for that person to acknowledge that they have a problem and to take responsibility for it. Counselling is only one way of helping, it doesn’t suit everyone and isn’t a magic fix. A counsellor can only give someone the tools to help themselves. If your relative does want support in changing, what can you do? The first thing is not to confuse help and support with saving or rescuing. You can support your relative in taking responsibility for themselves, sustaining that and taking back control over their lives. It is also necessary to trust them to do that, even to try and fail if that’s what it takes. No addict can recover if they are not allowed to. For you, it’s about setting firm boundaries, “No, you can’t come in if you’re drunk.” “I’ll give you the bus fare for work, but if you spend it on drugs, there will be no more.” It’s also about praising success but not criticising failure. Practical support can help, encouraging the addict to talk to you when he/she has cravings and you may be able to help him/her focus on physical activities, run a bath for him/her or eat a meal earlier than usual. You can learn how to support the drinker if he/she wants to stop, ensure to encourage the drinker to reduce alcohol consumption by 10% per day, suddenly stopping drinking is highly dangerous as potentially fatal fitting can occur. Helping and supporting is a complex process which may be extremely difficult and may not come naturally to you, but it is likely to bring more success than saving or rescuing. When trying to make change for yourself, it’s important to recognise your own limits and that you can only manage what you can do at any given time. It’ very easy for someone outside of the family to tell you that you should throw your addict out. You may feel that you ‘ought’ to but you may not want to. Unless at that time you feel strong enough to do that and sustain it, it may be a pointless exercise. If you are going to feel even more stressed and anxious by doing that, it won’t be very constructive. Empty threats can prove useless. It’s only if you reach the stage of feeling that you cannot put up with this person in your home any longer and that you want them to leave, it can work. If you make a threat or give an ultimatum that you’re unable to honour, you’re giving your addict the message that they can do what they like free from opposition. It’s actually better to do nothing, or find an alternative than to make an empty threat. Equally, there is no point in torturing yourself under the guise of reassuring yourself. You may scour the house for bottles, either full or empty, or check hiding places for drugs or equipment. If you find them, it confirms what you already know and if you pour away the drink or destroy the drugs, they will just buy more and find a better hiding place next time. If you don’t find what you are looking for, does it cause relief and lead you to believe they have kept their promise and stopped? Usually, you think they have just got better at concealing it, you become more suspicious and worry even more, convinced that they are lying. In this way, you continue to torture yourself but it makes no difference to the user. to understand your responses and reactions to the substance misuser and to develop different responses. to look at the role of blame and guilt both in yourself and others in the family and the impact that has. to develop your own self-confidence and assertiveness, so that you are able to prevent the addict from imposing their will on you. In making change for yourself, you may have the knock-on effect of getting the substance misuser more in touch with himself/herself, eventually bringing about their own changes. This might not work and they may never change, but you may at least be able to improve the quality of your own life and the lives of other family members. You will never approve of what the addict does, but you may be able to accept that your relative has chosen the route of addiction, and recognise that you’re entitled to a life of your own, without remaining trapped within theirs.